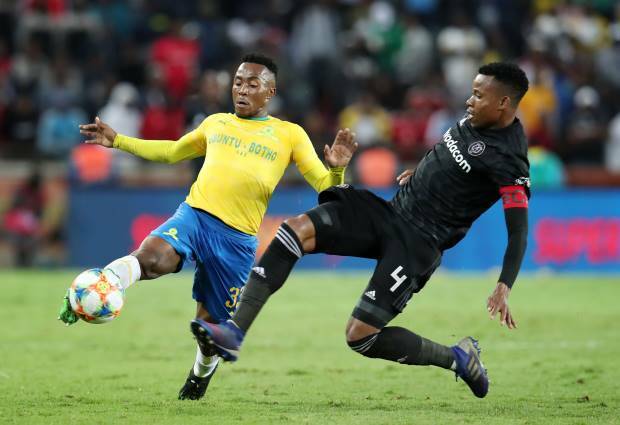 Orlando Pirates and Mamelodi Sundowns shared a point-a-piece in Monday night's Premiership 0-0 draw at the Orlando Stadium. Sundowns came close in the early stages as Thapelo Morena fired just wide from close range inside the first 10 minutes. In addition, Pirates goalkeeper Wayne Sandilands had to be alert in the 16th minute as he turned away another long range effort from Hlompho Kekana. It went away for a corner. Pirates were not really that threatening but did call Downs' keeper Denis Onyango into play just before the half-time whistle. In the second stanza it remained tight but there would be a change due to an injury. Sandilands was taken off after a blow to the face and was replaced by Siyabonga Mpontshane. Soon after Justin Shonga threatened but Onyango was alert to avert the danger. In the last 15 minutes Onyango denied Augustine Mulenga, who was played in by Luvuyo Memela. With that said, Mpontshane kept out the lively Themba Zwane's strike inside the last 10 minutes as it ended 0-0 in Johannesburg.